As I’m sure you were all following our harrowing experiences dealing with “El Derecho”, I’m also sure you know I haven’t seen one second of today’s Prologue. But, seeing as I’m desperate to get back on track, I’m gonna fake this. Weening the race of the Tour de France gives you nice jersey, and nice lion. It also gives you ideas for great twattle. Fabian Cancellara provided just that after laying the Suisse smack down on the 6.4km Prologue course. Apparently the #TdF12 6.6km prolog is similar to a backflip-nac nac-superman-seat grab. Brah. Those finishing behind #FabsClinic today provided some intrigue. Wiggo wasn’t a surprise, but it was a confirmation of form. Lovely to see Tejay up there in 4th. Sylvain in 3rd provides a ‘WTF’, then a hauts-cinq for the smash. Also providing a ‘WTF’ was Gilbert. But he’s on home soil, so it’s understandable. But, my favorite insight into the TT in miniature comes from none other than an extrememly on-form @captaintbag1. 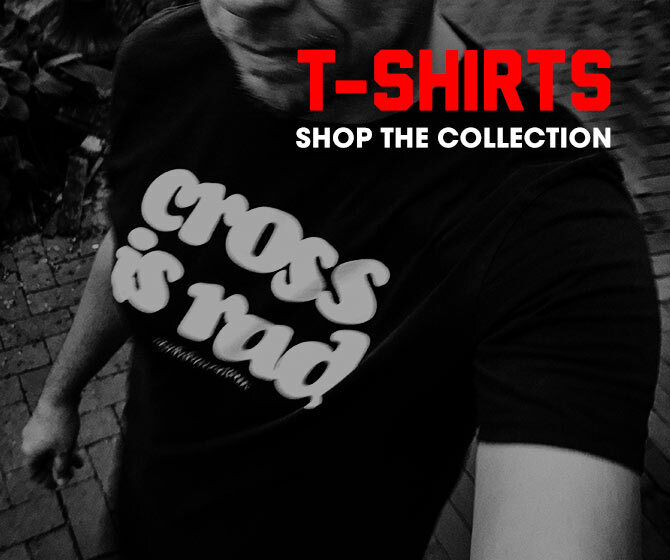 This particular ramble was spurred from a @Vaughters tweet linking an article. Also, worth a read. Full results obviously available from Cyclingnews, VeloNation, and VeloNews. @Cyclingtips posted an amazing array of images from today. Definitely a must view. 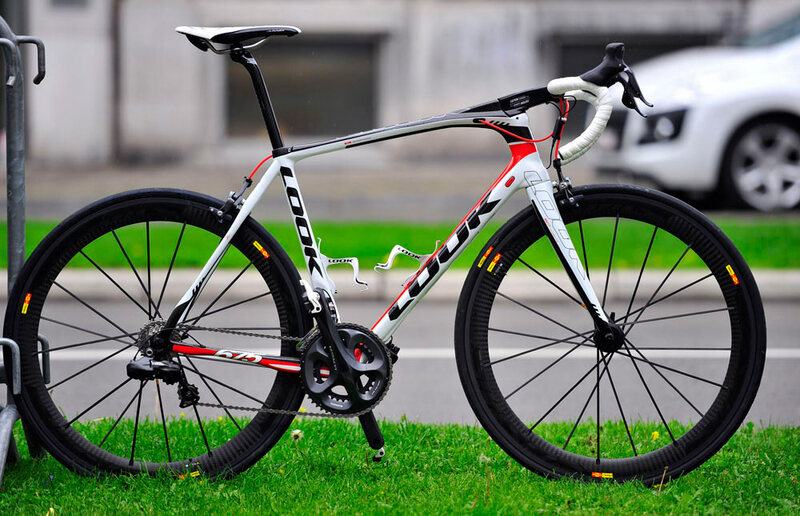 @CaleyFretz gets the lowdown on the new LOOK 675 endurance bike. James @AngryAsian Huang got to check out Garmin-Sharp’s ciclo livery. 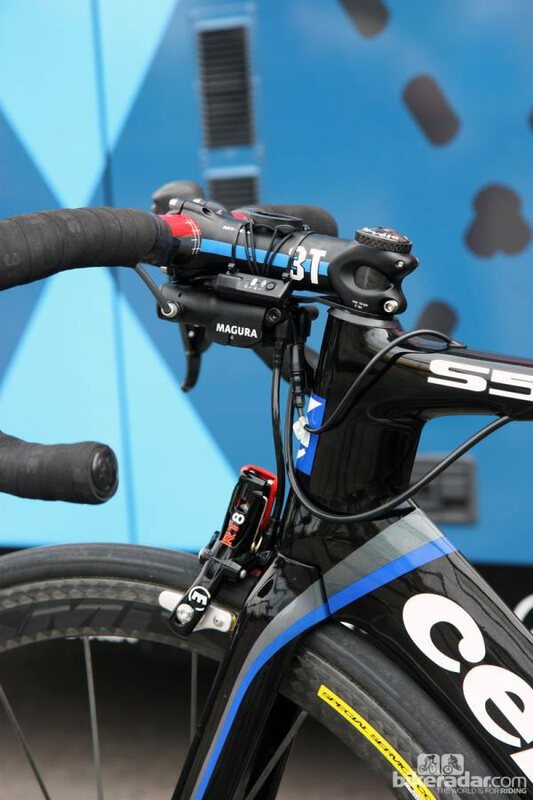 Interesting to note they’re using Magura hydro-brakes for their TT bikes while @Millarmind and @DZabriskie are also using them on their road macheens. Caley also snapped some shots of Gustav Larsson’s Bianchi Pico Crono macheen. 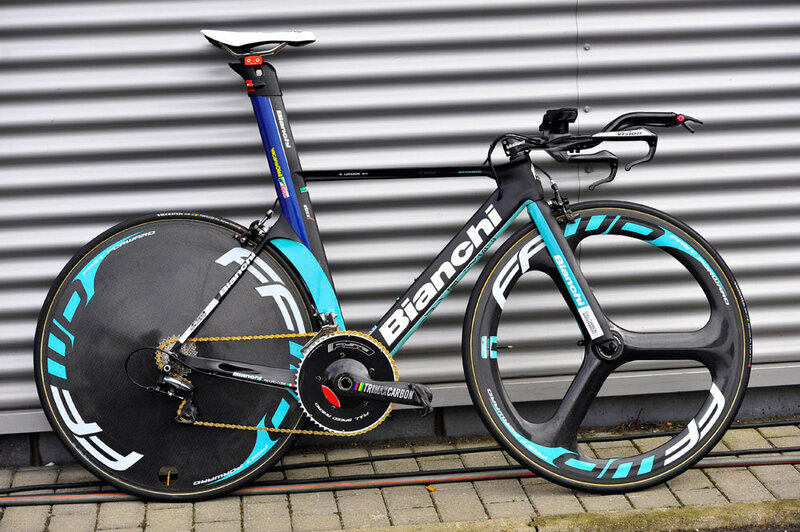 I swear this is a futurized carbon replica of Marco’s ’98 TT bike.